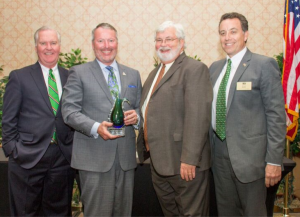 Buddy Dyer was elected Mayor of Orlando in 2003 and has worked tirelessly to advance the community’s shared vision for Orlando as America’s 21st Century City. A successful attorney in private practice, he was first elected to public office in 1992, serving Orlando in the Florida Senate for 10 years and being reelected twice. During that time, his colleagues recognized his outstanding leadership skills and elected him as their Senate Democratic Leader, a position he held for three years. Prior to his public service, he worked as an environmental engineer and practiced law. He earned a bachelor’s degree in Civil Engineering from Brown University and a Juris Doctor degree from the University of Florida, where he was Editor-In-Chief of the University of Florida Law Review and a member of Florida Blue Key. 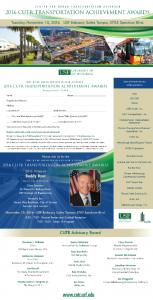 The 2016 CUTR Transportation Achievement Awards Event was held on Tuesday, November 15, at the USF Embassy Suites. 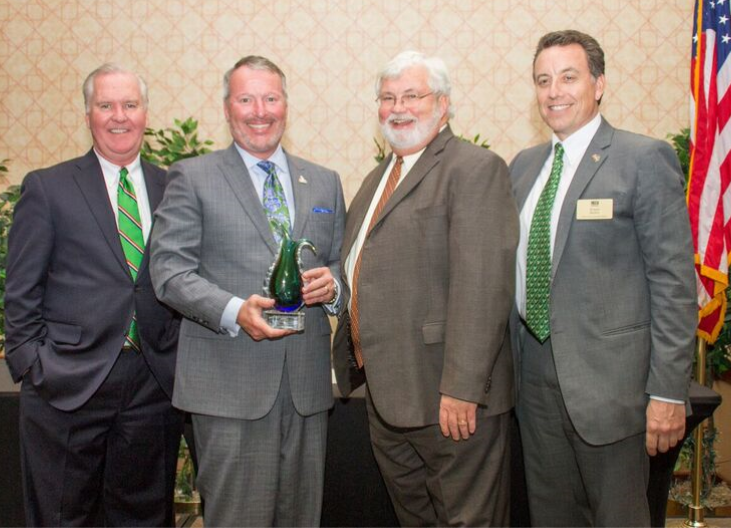 Orlando Mayor Buddy Dyer was presented with the award by Tampa Mayor Bob Buckhorn and Florida Senator Jack Latvala. 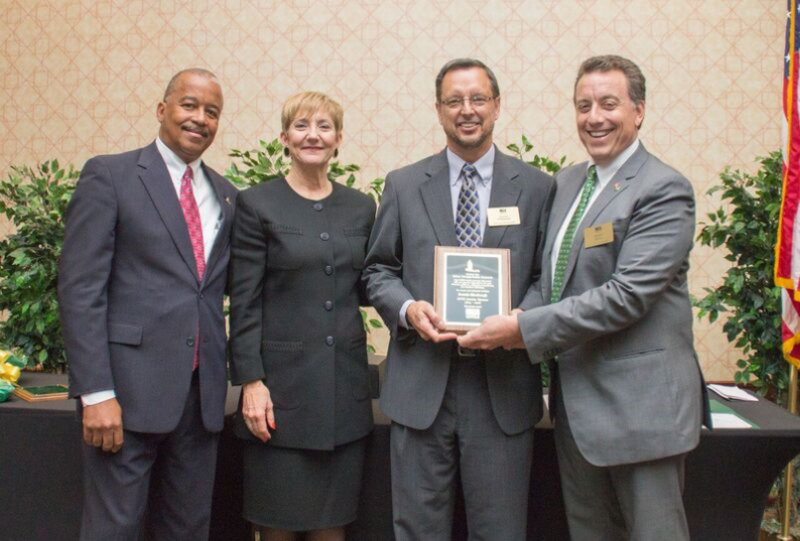 This year’s guest speaker was FDOT District 7 Secretary Paul Steinman. 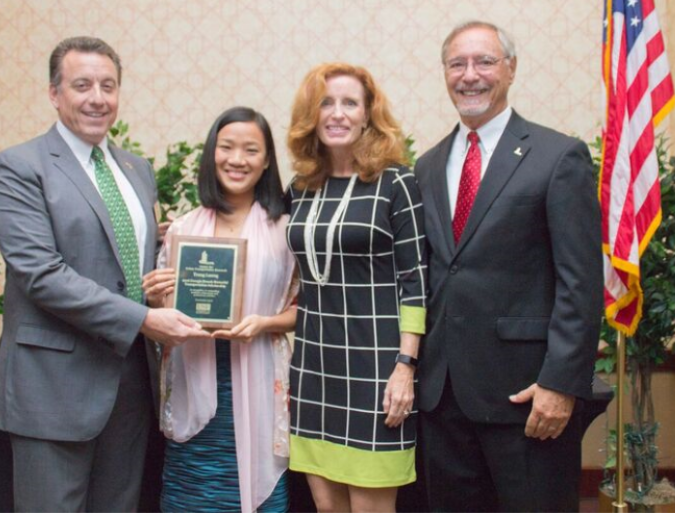 Trang Luong was awarded the 2016 Georgia Brosch Memorial Transportation Scholarship. She is a graduate student in the USF Civil and Environmental Engineering Department and is current USF Student Chapter President of the Institute of Transportation Engineers (ITE). She is active in the USF Engineers for a Sustainable World, American Society of Civil Engineers, and USF Engineering Senate. She will receive an MSCE in May 2017 and received a BSCE from USF in 2015, when she was named the USF System’s Outstanding Graduate. Trang currently works as a graduate research assistant under Dr. Abdul Pinjari in the area of truck travel behavior. 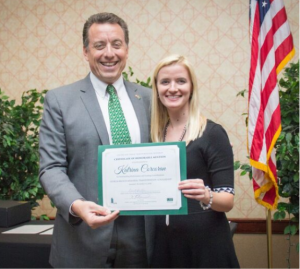 Katrina Corcoran was recognized with an Honorable Mention for the Scholarship. She is pursuing a master’s degree in Urban and Regional Planning. 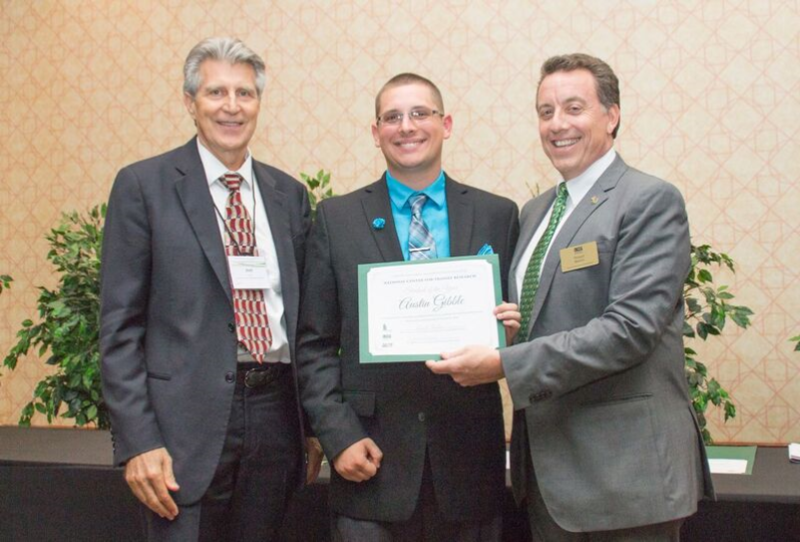 Austin Gibble was awarded the 2016 CUTR NCTR Student of the Year award. 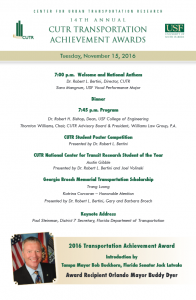 The award includes $1,000 and financial support to attend the TRB Annual Meeting in Washington DC. 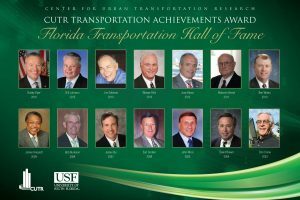 He also will be honored at the Council of University Transportation Centers Annual Awards Banquet with other university student awardees. Austin is pursuing a master’s degree in Urban and Regional Planning. Kimberlee DeBosier was recognized for her 10 years of service as Chair of the CUTR Advisory Board. She is Vice President of JMT (formerly Bayside Engineering) and a Fellow of the National Society of Professional Engineers. Her civic leadership in the Tampa Bay community is extensive, including terms with the Tampa-Hillsborough Expressway Authority (including serving as chair from 1999-2003), the Hillsborough County MPO, the Greater Tampa Chamber of Commerce, the Development Committee of the Glazer Children’s Museum, the USF College of Engineering Board, the MacDonald Training Center, and the Mayor’s Beautification Program. 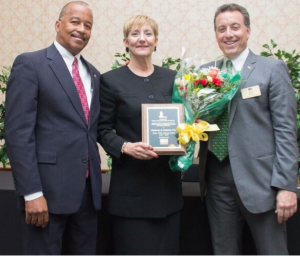 Her leadership and guidance have been crucial to CUTR’s success. Dennis Hinebaugh was recognized for his role as Interim Director of CUTR from March 2014 through August 2016 and serving admirably in overseeing CUTR’s growth and positive evolution. 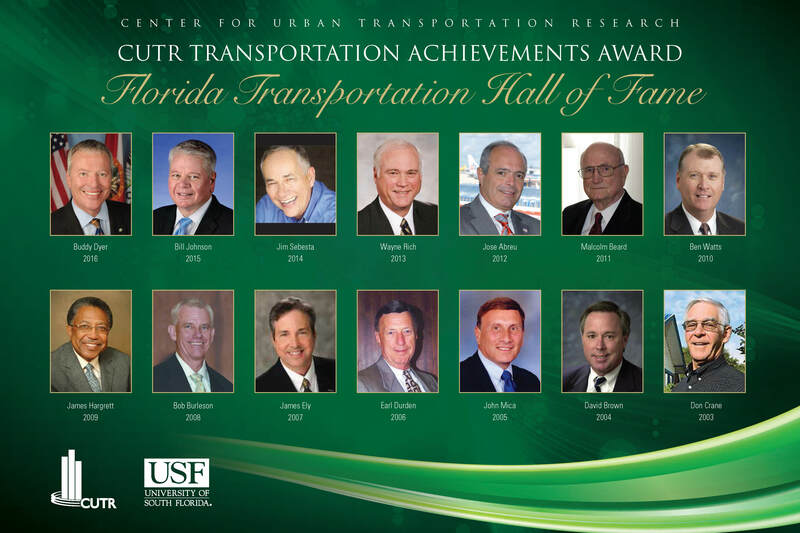 Florida Transportation Builder’s Association, Inc.